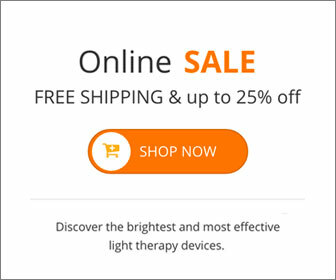 Whether you are someone that has never used a light box or someone that has been using light therapy for years, I’m sure you have wondered about what effect light box therapy for SAD has on your eyes. Since every type of light is different, they can all have different effects on your body. Full spectrum lights have harmful UV rays that need to be precisely diffused so that the ultra violet rays don’t reach your eyes. If your eyes were exposed to UV rays at a close proximity they could get sun burnt and it could cause serious damage including the risk of blindness. When choosing a light therapy box, it is very important to find a unit that uses broad spectrum lights. Broad spectrum lights do not contain any ultra violet rays so they are perfectly safe to use everyday. With these seasonal depression lamps, there are very few possible side effects – these include eye strain or a headache. Even if you experience one of these side effects, it probably won’t be for long. Once your body has adjusted to extra light it is absorbing (about 3 sessions) any side effects from your therapy lamp will usually stop happening. With very little possible side effects and no risk of permanent damage, a broad spectrum therapy light is the way to go. This entry was posted on Monday, September 11th, 2017 at 10:05 am	and is filed under Light Therapy, Uncategorized. You can follow any responses to this entry through the RSS 2.0 feed.